I really hope you are all enjoying the countdown, and the peeks. Well this month as part of our countdown, Nichole asked her team to come up with a Valentine Day treat. While I LOVE all the holidays and coming up with fun ideas, by now you may know my love does not lay with any type of cooking or baking. I’m sorta the type that likes home-made containers, and prefers wrapping something store bought in a fun way! LOL! I enjoy taking the time to create the packaging, not the baking process! LOL! I’ll leave those cool cooking ideas to the rest of the girls 😀 Plus it saves me more time to stamp. Could this skunk be any cuter? I think this is so stinkin adorable! (pun intended). This gift item uses the NEW! RELEASE-Forest Friends. I’m totally loving that set!!! 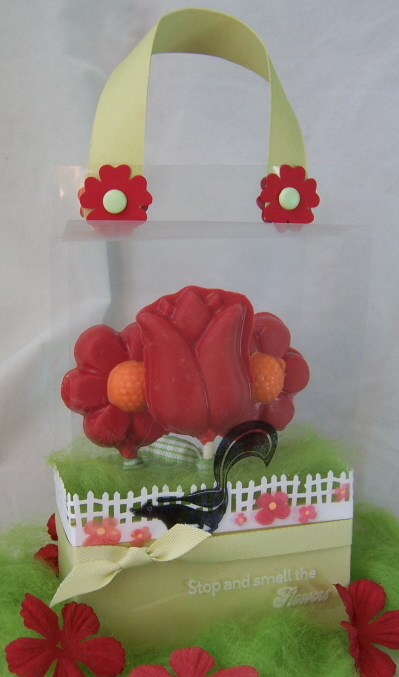 I used my lollipop along template to create a traveling chocolate lollipop garden. When I saw this skunk I fell in LOVE! He/She is adorable. I also laughed so hard when I saw it because I don’t know what it is, but Alexa (my 9yo) has a love/hate relationship with skunks. BIG TIME! So this is for her. I made my base from Spring Moss. Punched my holes for the lollipop sticks. These pops are large and I wanted them well seen, so I only used 3. I then punched a fence border (a Martha Stewart punch) and wrapped it around my template. The “grass” is what is called wool roving. A hobby I THOUGHT I would try, but never did get to. I’m happy because the wool came in handy for my grass. I love when that happens. I made my wrap from acetate, and stamped my sentiment in white stazon. 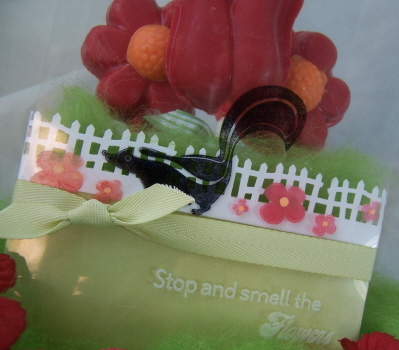 I then stamped my skunk in black pallette ink (lightly heat set), then my flowers in white stazon. I used my Poppin acetate technique with Pebbles Inc pearlescent chalks for the flower to pop out in color. 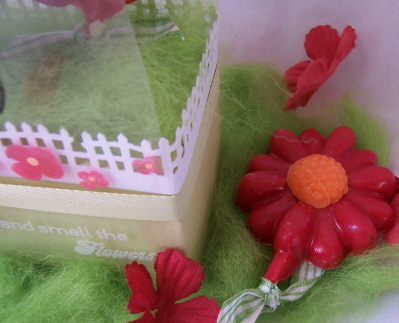 I then took a Souffle gel pen for the flower centers. This project took MAYBE 20 minutes. Really simple. Tomorrow’s peeks are my favorite items 😀 So I hope you are ready! Sketch time and another template peek! We interrupt this weekend of countdowns to bring you a sketch challenge! 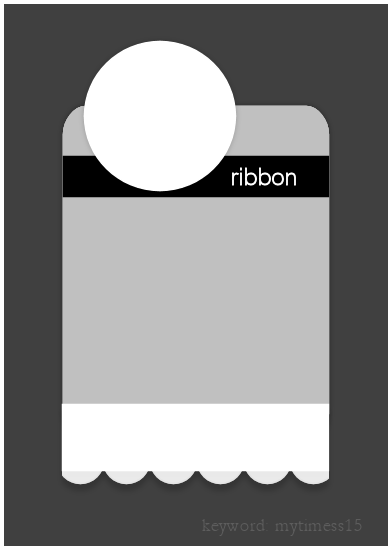 Oh and a uber cool new template peek too! I have NO IDEA where the month is going. I’m no where near done my Christmas stuff! YIKES! We have had no power on & off due to ice storms so sorry this is late. I used the Out of the Box image-popped out with a circle punch. The sentiment is Heartfelt Basics (love that set). My “patterned paper” was done using the background basicis stars, colored in olive and blue. I stamped them in blue first, then colored the edges with a marker before stamping them. I used my glue pen to add some bling to the centers. I think they look like cute flowers. Don’t miss the sketch team samples too! Now how is this for a gift presentation? Black and shimmery white is just an elegant and stunning color combo. Perfect for any style. I made this gift to re-package a jewlery kit. This will be for my MIL. She loves making jewelry. I purchased a make your own photo bracelet kit. I cannot for the LIFE of me remember where! I want to say Michaels, on SALE for $3 after Christmas last year. I KNEW it would come in handy-someday. In this Desk Top Stationery holder, I have put 3 of the small hinge tins. They are a PERFECT fit. I think you can fit 6 of the tins in this template. Not positive. I covered each tin which is stamped with the leaf pattern label from Limitless labels ( I LOVE that set-and not just for candy nuggets!). I just created 2 sections for my gift. the 3 tins on one side, with my jewelery supplies, which tie in with some satin ribbon, and my necklace. You can see the gift packaging in the background. 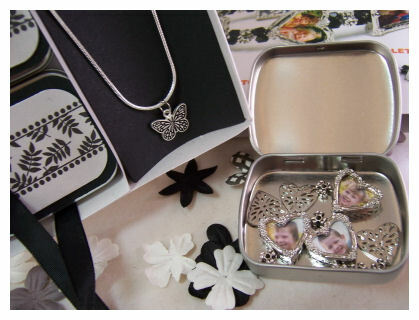 The bracelet kit included 3 heart shape photo holders which I put in one tin (and I already put the kids photos in there) and 3 rectangle ones, which are in the other tin (that has myself, Jay and a photo of Daisy in there). The third tin had the string and additional beads in the kit. I whipped up the necklace myself by purchasing the butterfly charm, and necklace separately. Well I hope you get inspired to try the sketch, or more uses for the templates!